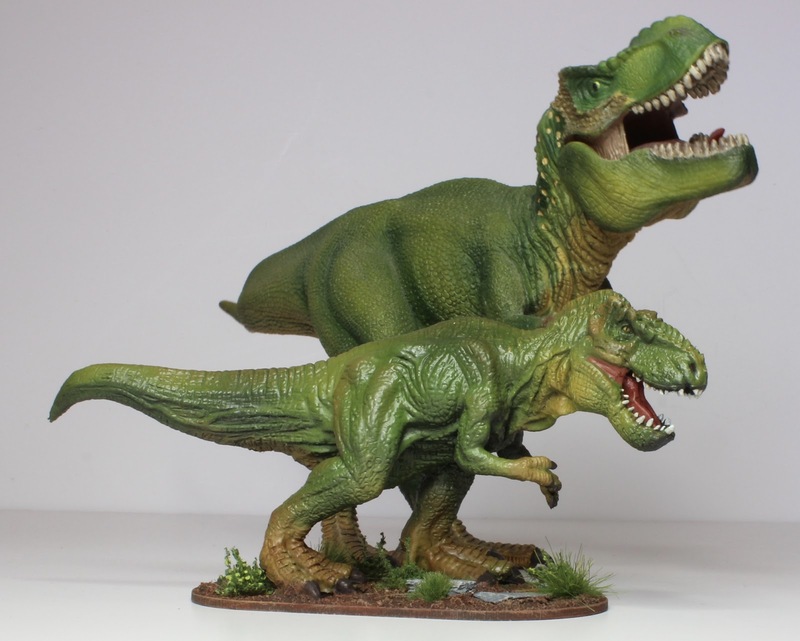 Hot on the heels of last week’s 'Mighty Megalosaurus', I present, for your delectation, the fearsome Tyrannosaurus Rex! This most wholesome of hobbies is blessed with a community of hugely generous souls. One such person is Roger Webb, who last year, quite inexplicably, packaged up a Christmas gift and sent it on its way to Awdry Towers. 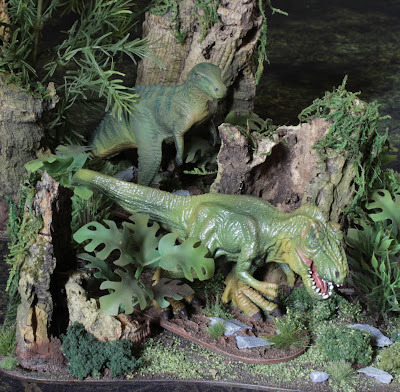 Well I am delighted to report that, ‘Junior’, as he has been named by the ‘Saintly Mrs. Awdry', has finally been completed and is ready to take centre stage in all manner of prehistoric pulpiness. Unlike the hard plastic of the Megalosaurus, the Tyrannosaur is made from a substance with a little more give to it, more akin to the ‘Reaper Bones’ material. That said it seemed to take the undercoat reasonably enough and was then given the now standard application of a couple of varying tones of green using Vallejo Model Air. The sculpt is particularly fearsome and really nicely done, not dissimilar to my beloved 'Schleich' Rexie, not dissimilar apart from, of course, his stature! Given their uncanny resemblance it seemed to me that Junior should be painted in such a way that he could be the offspring of the towering 'Scheich' version. Again as with the previous post the initial base layers were added to with some dry brushing followed by picking out the details with a fine brush. All went swimmingly well until it came to the varnishing stage. 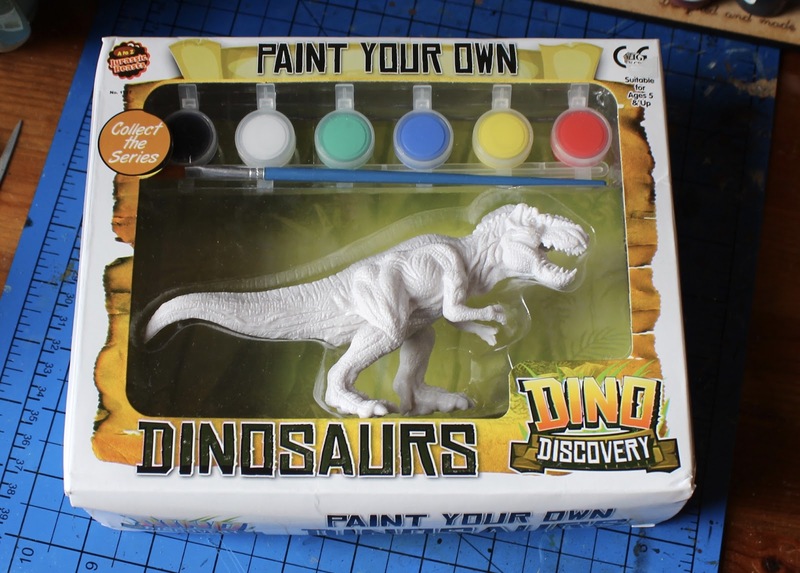 My preferred matt lacquer has reacted in an odd way with the plastic leaving me a slightly ‘tacky’ dinosaur. Interestingly it has dried as normal around the feet, but the upper body is strangely sticky. I would like to say that the stickiness is abating, but I am not entirely convinced and I shall have to continue to pat down my tacky Tyrannosaur for the time being. Unnerving texture aside, which I should clarify is all my fault, I am rather pleased with how Junior turned out and must, once again, thank Roger for his very generous gift. This is awesome! I really like the last picture with Junior in his natural habitat! Thank you Sander, I had a lot of fun with that last photograph. Junior is a most worthy addition. Beautiful job....odd the vanish has reacted with the plastic after painting ? Thank you Matt, all very strange, I am hoping that it might settle down at some point. Thank you Roy and certainly there are a fair few beasties roaming the corridors of 'Awdry Towers' now, perhaps too many. Outstanding stuff, Michael. Its interesting that you mention the material is similar to "Bones" as a few of my "Bones" minis suffer with tackiness syndrome - so I wonder if its something in the plastic? Roger is a tip-top chap too, and its a shame he is currently taking a bit of a time-out from the hobby, as he's much missed imho. Thank you Simon, the tackiness is a little frustrating and on reflection I wonder if I should have sealed the plastic first? It definitely seems to be a reaction with the varnish and not the paint though. As for Roger, I couldn't agree more, I do hope he returns soon. Thank you Dave and that is very interesting to read, in this case it must be the varnish so I will bear in mind your advice next time. This beastie needs to be on a leash.. not sure the local park would approve of walking this thing in public. Lovely work Michael and lovely model (I`m a big fan of this sort of plastic - model kit or otherwise). Junior came out very well indeed. I was worried by your title, thinking it might be a sartorial reference. You've given us Zombie Elvis so Hawaiian shirt Rex wasn't impossible. 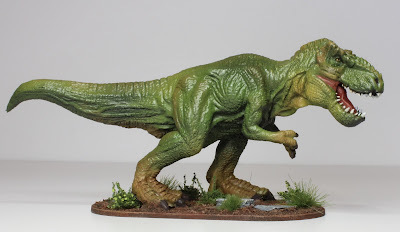 I find ot so encouraging to see relatively cheap figures brought to such a high standard - Junior is a very worthy addition to your dino collection. Thank you so much Joe, it was great fun to work on and very helpful to have the other version to try and match the colour to. The "Elemental child" and "Warlord of the Royal Crocodiles" Walking through "Stacey Grove" "By the Light of a Magical Moon"
Oh that's very clever Paul, very clever indeed! Amazing work! The pair fit together really well. A fine addition to the Dinosaur collection your amassing steadily. I have heard similar things but can't recall what the outcome was of trying to fix the tackiness. I may be even thinking of primer rather than varnish! Thank you Simon and yes there are quite a few now. Looks like Dave has a solution which is to seal the plastic first before applying the primer - sadly a bit late for Junior, but something worth remembering. Woooow! Fantastic work Michael! Arrrrrr! Junior may be sticky but he's certainly spiffy! Nicely done. Another excellent paint job! Really enhances the mini. 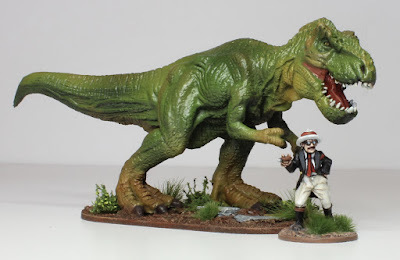 I like that it's smaller than the other T-Rex, too. There should be variations in size. I also like the pose with the famous African explorer (and the other pics). Thank you and I totally agree, a bit of variation is a good thing. Very good match between junior and mum there. Reminds me of my games of Saurian Safari. I really should dig that out again for the club. Thank you, I was pleased with the match in the end and yes you should definitely dig out your Saurian Safari games. Excellent paintwork my dear fellow. Both beasts are truly scary beasts. Lovely (air)brush work mate. You seem to have a knack for skin tones on the beasties. Thank you Millsy, delighted to have found a suitable colour match for the body and then it is just a case of adding some additional details with the brush. Very nicely colour matched and impressive end result! 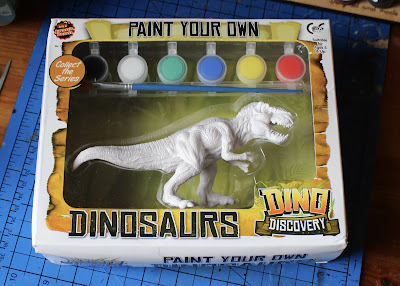 Making a kids paint toy look life like. . . . why am I not surprised? Lovely work, Michael and a good find by Roger. 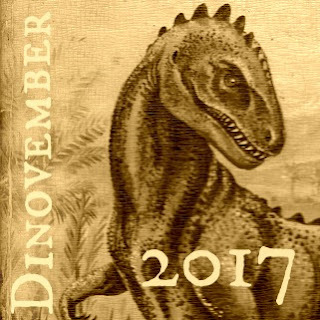 Taking a leaf out of your book, I've dabbled my toes in 'Dinovember', but not to the extent of your good self. Thank you Jez and I loved your post. I hope you can find the time to paint some of your collection. Thank you and yes there is quite a few beasties roaming around the place. Not sure you can ever have too many though? You may think he’s tacky, but that look was fashionable back then! That made me smile, thank you Kieron. Fine work on your ‚little one‘! A fine addition to your collection of dinos, Michael. I think the size difference between the two "Rexes" is very plausible. That is, I think I read somewhere that they would continue to grow until death - so long as they were nourished well enough, I suppose. Wow. Great paint job. Cool model. Another excellent addition to your collection Michael! It seems from the photo that Junior's feet seem as large as the bigger versions. Must be akin to dogs who will have huge feet, providing insight to how big they are likely to become.